Dementia is a degenerative mental illness which causes problems with memory loss, thinking and reasoning. Dementia usually affects a person’s mental health gradually over a number of years. There are different types of dementia, each with different causes – dementia is not a disease but a group of symptoms or conditions which affect the brain. One well known type of dementia, for example, is Alzheimer’s disease. Dementia can’t be cured but it can be managed or slowed down in some cases with medicine and mental activities. As a carer, or potential carer, for someone with dementia you may be a family member or a private carer. 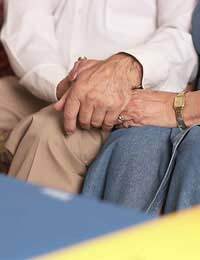 Whatever your relationship to the dementia sufferer, caring for someone with this illness can often be extremely demanding. There is help and support available for both dementia sufferers and their carers. Dementia sufferers may have problems carrying out everyday tasks such as caring for themselves, maintaining their household, cooking and even going to the toilet and as a carer these are likely to be areas that you help with depending on what’s needed. Because people with dementia may be confused or forgetful they may sometimes behave in an unusual or unexpected way and this is something that a carer will need to prepare themselves for. Initially this unusual behaviour may seem embarrassing, alarming or unnerving. Dementia experts often suggest avoiding getting into discussions with a dementia sufferer who is behaving oddly. Rather, they suggest that, as long as the person is not causing danger to themselves and others, that they are allowed to do their own thing. Dementia sufferers should be treated in a calm and gentle manner even if they are not acting that way themselves. Although someone with dementia may have lost their ability to carry out some tasks, it’s important that their carer doesn’t patronise them and instead helps them to live as independently as they possibly can. It is important that the dementia sufferer is still encouraged to do as much as possible for themselves and that they are praised and rewarded for their achievements. Caring for someone with dementia is demanding and it’s important that carers take the time to look after themselves and their own wellbeing as well as that of the person that they care for. It’s important that carers for sufferers of dementia don’t become isolated. Seeing other friends and family regularly is important. Carers should arrange regular alternative care through friends, family or professional respite care to make sure that they get sufficient time off from caring. Many people who care for dementia sufferers find that it’s helpful to talk to other carers. There are many support groups for carers and some are for carers of dementia sufferers in particular. These support groups exist on a local level and online. Help and support is available for carers of dementia sufferers. The type of support on offer includes advice and information, financial assistance and emotional help. Carers should first contact their Local Authority to make sure that they and the person they care for are getting all the help that they are entitled to. Charities and other organisations are a good source of support for carers as well. As a nurse specialist in this field and also holding a recent BA (Hons), I agree with most of the advice and information in your piece. What I do take concern with is the language. The term "dementia sufferer" is used throughout the article and that in itself is a negative view of personhood. The person may not be "suffering" at all and by using this term we assume that the person must be in distress. I realise the term does not hold this meaning in your article but I feel that we should move away from this term completely and if necessary just abbreviate "person with dementia" to (PWD). Hi.My Mum has been living with us for nearly a year now. She is 89 and only moved in with us as she set her kitchen on fire and had nowhere else to go. She refuses to go to one of my brothers but I do have some respite now and again from another brother ( my sister in law is great). I work full time but luckily it's in a school. I still have 2 grown up children living at home and the other 2 are regular visitors. My husband has been good about all of this but he just feels for me and doesn't think I should have to put up with this. Most of the time Mum is good and I can leave her when I go to work but there is a lot to think about before hand e.g. taking the nobs off the gas cooker, not leaving important things about the place as goodness knows where they will end up and so on. She gets very moody and will take herself off to bed (out of character for her). She is very tearful and constantly reapeats herself. I have to shower her and take care of her personal needs. She would refuse home care and has told me in the past that a care home would be the end of her. My life is not my own anymore and it's like living with a stranger. Her personality is different and I find myself questioning my love for her. This is very painful as we have always been close and I would hate my kids to have these feelings about me. At the moment I cannot bring myself to suggest to her about going somewhere for respite. In fact I wouldn't know how to go about it myself. I would be grateful for any tips or advice - when do you decide enough is enough. Joy. I've been doing a lot of research into Dementia and the caring for people living with it and found this article really informative. Thank you! I nursed my mother through her final very painful illness, while also looking after my father. Dad has had a form of dementia since he was hospitalised 4 years ago with a chest infection (which sent his temperature through the roof and made the siezures he suffers much worse). The hospital got it wrong- he contracted C.dif, and while delirious fell and broke his arm in several places. Too much morphine- kindey failure, and I was told to start planning his funeral. Luckily he survived- but the side of his brain that does numbers didn't. 4 years on, he can't remember his 53 year marriage- and has been referred to the psychatric nurse team. When dad took ill we moved to a double semi- with a connecting door. I do overnight care duties; Home Care call in to do his wash/dress routine and they make his lunch (total time- 25 minutes a day). I do medication, bed time routine etc. I work full time as a teacher. I don't go away unless Dad can come with me- so no holidays- not that that is anything new. I've had no holidays for over a decade since his seizures began. he falls a lot- and recently broke a rib, so sitting in the car is painful. This means not even a day trip this summer. He's a charmingly vague chap- and he's all the family I have, so I'm in no hurry to call time and put him into full time residential care yet. However other people keep telling me to ask for respite and get some time off. The only respite around here is what I can recruit and pay for. Has anyone got a happier story to share? Hi I found this article helpful as I am seeking a profession in care and neededan insight into the affects of dementia on suffers and their families to help me empathise and provide a service tailored to specific needs.